Today I wanted to share with you: Madrid from an architectural perspective. The Architecture Week in Madrid (8th edition) took place from the 29th of September until the 9th of October 2016. There were many architectural events and “open houses.” The majority of the buildings I’ve got a chance to visit for the first time, because these places are usually not opened to the public (some yes, but with charge). Yet thanks to the Open House Madrid (2nd edition) this was made possible. Many buildings offered a free tour on their premises. On the other hand, I had to make an online reservation and secure my spot as the special locations were sold out in less than 15 minutes. Some of the 14 buildings I visited had the most breathtaking views of Madrid. Prepare to be blown away! I wanted to split this blog post into 2 parts, so today I will only show you 7 places that I had the privilege of visiting. Built/ designed by: Fernando Higueras and Rafael Moneo. Current functions: The Spanish Cultural Heritage Institute is the institution of the Ministry of Education, Culture and Sport dedicated to the research, conservation, restoration, documentation of the heritage and specialised training. Design style: Classic, functionalist and idealistic. Interesting facts: The headquarters of the Institute was subsequently built by Fernando Higueras and Antonio Miró in a batch process that ended with his occupation in the year 1985. The second is its history, because this building had to make a long journey, it changed from use in up to 13 occasions and was abandoned for 16 years. It is also listed as a building of Cultural Interest in 2001. Spanish Cultural Heritage Institute also referred to as ‘the hospital of art,’ because they restore many artefacts to their original glory and also uncover hidden works with the help of X-rays. Here showcasing its famous Crown of Thorns (top left and right), the cover of the Crown of Thorn (bottom left) and the library (bottom right). Built & designed by: Lamela Arquitectos. Current functions: Office space of the Study of Lamela Arquitectos and it’s also being rented by other companies. The building also boasts an important space for temporary exhibitions in the access gate. Design style: Contemporary and abstract. Interesting facts: Arturo Berned (architect and sculptor born in Madrid in 1966) used to be the Project Manager at the Study of Lamela after having worked in Mexico in the 1990’s. Outside the complex some of his sculptures are displayed. The Study of Lamela Arquitectos isn’t your ordinary architect studio, because there is also an exhibition by the sculptor Arturo Berned. Madrid’s Cuatro Torres Business Area (four buildings) in the business district of the Paseo de la Castellana. This picture was taken on the rooftop of the Leitner Building. Year of built: 16th century. Built & designed by: Used to be the palace of the Marquises of Villafranca and the current interior was designed by Duarte Pinto Coelho (Portuguese interior designer and socialite, 1923-2010). Current functions: Especially used for social events, celebrations, meetings and other exclusive happenings. Design style: Mixed with different styles such as traditional, Victorian, Baroque and antique styles. 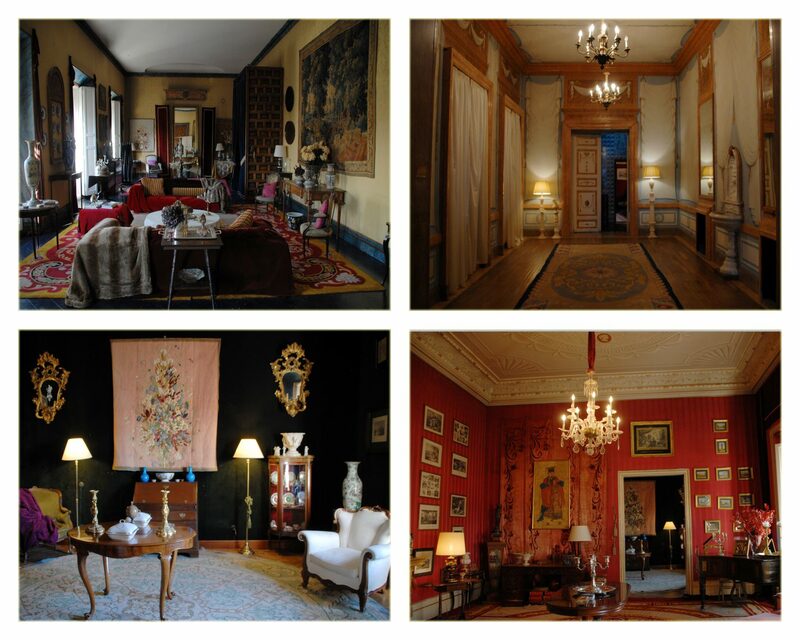 The Palace of Duarte Pinto Coehlo is an extraordinary place, where one can host exquisite parties (Spain’s Vogue Magazine had done so in the past). Built & designed by: Initiated by José Espelius Anduaga (Spanish Architect, 1874-1928) who died without seeing its completion. Later its construction was continued by Manuel Muñoz Monasterio (Spanish Architect, 1903-1969), who years later was part of the construction-project of the Santiago Bernabéu Stadium for Real Madrid. Current functions: Bullfighting (from March to October), concerts (I went to Romeo Santos’ concert back in 2014), theatre and other events such as Tennis (Davis Cup, 2008) and Red Bull X-Fighters (last event was in June 2016). Design style: Neo-Mudéjar (Moorish Revival style) and has a sand arena. Interesting facts: The bullring was inaugurated on June 17th of 1931 and it can hold up to 24.000 spectators. During the Spanish Civil War (1936-1939) some of its installations were used as a prison, weapon arsenal and for keeping animals. The strangest part was that the sand arena was turned into a vegetable garden, which provided the soldiers with a food source. Since 1994 it was declared to be Spanish Property of Cultural Interest. If you are ever in Madrid don’t forget to visit the Plaza de Toros, which is one of the most emblematic places in Spain! Built & designed by: Rafael de La-Hoz Arderius and remodelled (2010-2011) by his son Rafael de La-Hoz Castanys. Current functions: It’s currently being rented by the prestigious Pérez-Llorca law firm. Design style: Abstract, modern and innovative (they were ahead of their time!). Interesting facts: This crystal-prism building seems to be floating weightlessly thanks to the ingenuity of the architect Rafael de La-Hoz Arderius. The structure that holds the tower is situated on one-side instead of the middle. Additionally, it has two layers of glass limiting the greenhouse effect. The outside layer of glass is supported only by glass, which is quite impressive. What also captured my attention is that it embraces 3 cultures of the Mediterranean: the Egyptian, the Roman and the Jewish temples. The access stairs (not visible here) to the Castellar Building (right picture) seems like the stairs to an ancient Roman temple, the interior passage (left picture) bears the resemblance of an Egyptian corridor within a pyramid and the limestone wall (left picture) looks like the Western Wall (or Walling Wall) of the old city of Jerusalem. Freemasonry or masonry defines itself as an institution of discrete initiatory nature, not religious, philanthropic and philosophical founded in a sense of fraternity. It has as objective the search for the truth through reasoning and fostering the intellectual and moral development of the human being, in addition to the social progress. In Spain, the Freemasonry was founded in 1889, which is linked to the English Freemasonry. Moreover the Grand Lodge of Spain (Madrid) was created in 1982. The Mason Lodge or temple has many rooms for their meetings or rituals. Current functions: The members (Apprentice, Journeyman or Fellowcraft, and Master Mason) of this fraternal organisation meet in the Masonic halls just like in any other organisation. Aside from that, they also hold initiations of new members or the ascension of senior members. Design style: Abstract, mystical and a lot of geometry. Interesting facts: The Freemasons were known to be builders, for example they were the ones who build cathedrals. During the Spanish Dictatorship (1939-1975) under Francisco Franco’s regime, the Freemasonry was banned. Four years after el Caudillo’s (he was a military dictator) death in 1975, the ban was lifted. The main symbols of the masonry are: square (righteousness), the compass (the limits) and the “G” represents the Great Architect of the Universe (creator). The Grand Lodge of Spain and the Masonic halls. Built & designed by: Antonio López Aguado (Spanish architect, 1764-1831), and later by Custodio Moreno (Spanish architect, 1780-1854). Current functions: Major opera house (also ballet), with productions of singers, musical actors, notable musical directors and prestigious dance companies (national and international). Interesting facts: The building itself has the form of a coffin, but according to the guide this had been done because of the formation of the streets. Traditionally people would go to the theatre and talk about their businesses. It was closed between 1925-1997 due to the underground damages during the nearby construction of Madrid’s metro system and the lack of financial aid, it was finally reopened again in 1997 and has seating for around 1.746 visitors. The Royal Theatre, depicting the entrance/front facade (top right), the main hall (top left) and the dining area is the exact recreation of the starry sky when the theatre was opened in 1850 (bottom left) and one of the ‘ball rooms’/lounge area (bottom right). Unfortunately there were no photos allowed of the stage area (and orchestra), which it’s approximately 1.400 m2 and has astonishingly 18 set changes thanks to the technological platforms! Evidently every location or building I visited was distinct from the other. The tours were very informative and I most definitely enjoyed taking photographs (I took about a thousand or more!). Moreover, the volunteers (most of them were architect students) of the Open House Madrid managed to captivate me with the history of the edifices, but I also got to understand the architectural designs. The Spanish Cultural Heritage Institute. My favourite view (Plaza Oriente) taken from a patio at the Royal Theatre, the Royal Palace and the Jardines de Lepanto (gardens) as one of the main attractions of Madrid. What’s your favourite location on this blog post? Wishing you a nice remainder of the week! Celebrating my One Year Blogging Anniversary at a Castle!